Allows to define the printing properties. Each view has its own printing setup. This is where the title for the current view is shown. The title can be edited to appear at the top left of the printed page. It is possible to enter a different text that will be printed at the top right-hand side of the page. Press the Change button on the right and then select Add, as we also explain in the Setup a logo page; add your own logo. Back to the Page setup window, choose Logo instead of none. It is possible to input the page margins here: Left, Right, Top, Bottom. Measurements are in centimeters. This function makes it possible to adapt the printable area when the print goes past the earlier defined page margins. This is the text that is being entered in the File and Accounting properties found in the File menu. The page header will also be included in the printout. The table header (f.i. Accounts, Transactions, etc.) is also being included in the printout. These are the headers for the various table columns. The program prints the headers using a slightly larger font. When activated, this option maintains the entered page breaks; if not, they will be ignored, even if they are present. Activate this option to request that the pages be numbered. Activate this option to include the hour when the page was printed. Activate this option to include the date when the page was printed. Activate this option if a progressive number is to be given to each row. The grid can be printed just as it is viewed on screen. The program automatically adapts the page dimension. This allows the increase or decrease, on a percentage basis, of the size of the font to be printed. If some columns exceed the width of the page, the program reduces the columns or reduces the zoom so that all the columns will be printed correctly on the page. The print-out will be carried out exactly as presented on the screen. 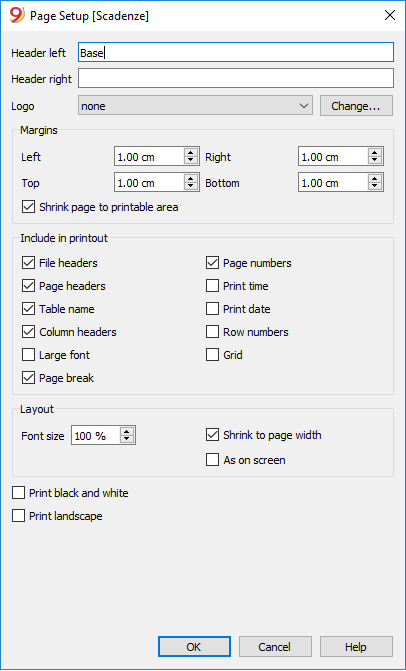 If the option "Reduce to page width" is not being activated, the part that goes past the paper will not be printed. All colors will be converted in grey scales. To print in landscape format which makes the page read horizontal.